CoolFarm South Korea is taking off! CoolFarm in/store was chosen from over 1.500 innovative products worldwide to participate in K-STARTUP GRAND CHALLENGE 2017, in Seoul, and to do business development with South Korean government support. The entities that directly assist on the program are: i) NIPA (National IT Industry Promotion Agency); ii) the Ministry of SME´s and Startups; and iii) CNTTech Accelerator (a global foodTech platform Service provider with over 100 Korean B2B Food Franchise customers and over 96% market share on the foodtech platform industry. They have numerous overseas businesses in China, Singapore, Japan among others). CoolFarm in/store is a closed and vertical system with a clean and climatized environment inside, perfect to grow premium seedlings, microgreens, leafy greens, herbs and flowers. It uses 90% less water than common agriculture and it does not need pesticides nor herbicides. It is modular, whereby each module starts with approximately 100 square meters of production area. Its modularity is applicable both vertically and horizontally, providing a quick return of investment. The system is intelligent, highly intuitive and its trays come to the operator by elevators when requested. It is ideal for growers, food distributors, grocery and supermarket chains, restaurants, hotels, cruises, research centers, medical centers and communities. in/store provides transparency, traceability and minimizes the food waste. in/store is a certified clean room with an antechamber including two alternate doors to prevent any type of contact between the plants and the outside, providing to producers a high quality and contamination controlled environment to protect their premium crops. It also uses absolute air filters and a positive differential air pressure between the growing area and external environment to avoid fine particulates and pollution infiltration. Trays come to the operator when requested ensuring minimum contact between operators and the growing area. Plant boxes are available for a ready-to-sell action eliminating the seeding and harvesting labour, meaning no more time spent on seeding or harvesting! Boxes with seeds inside are available for a ready-to-sell action. Each box includes substrate and seeds. CoolFarm provides all possible varieties and mixes. Vases and substrate plugs (for example for lettuces) are also a choice. Using these boxes, operators don ́t need to waste time on seeding or harvesting and the living plants are always ready to be sold to final consumers, already clean and ready to eat. Consumers can now get transparency, traceability, freshness, nutrition values and flavor in their vegetables. João Igor pitching at Blue Square, Seoul. 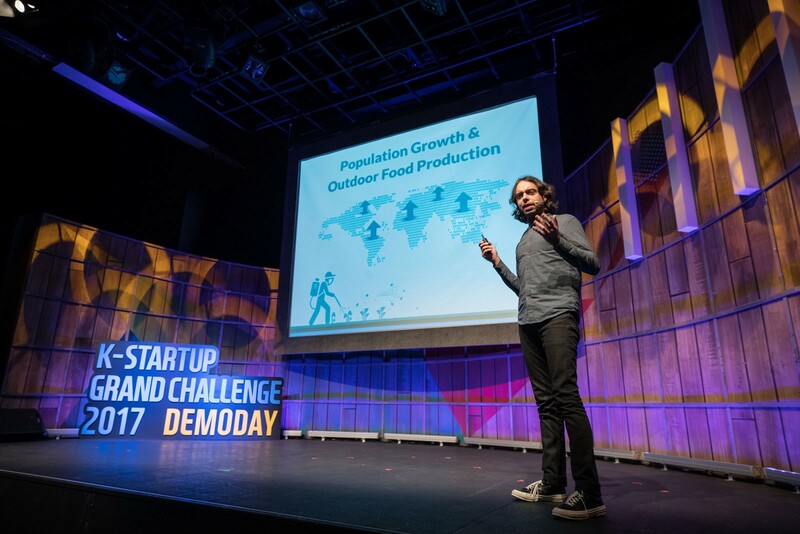 CoolFarm in/store gives to food suppliers the opportunity for them to engage with the millennials in the best way; control the vegetables all year round (regardless of the season) and also reduce the transportation costs and the waste; be more profitable and do good.